The Victorian Era lasted roughly 75 years, from 1825 to 1900, encompassing the reign of Queen Victoria of England. There were a number of architectural styles during this era: Neoclassicism (1840-70), Gothic Revival (1840-1900 and later), Italianate (1870-1900), Second Empire (1855-1885), Romanesque Revival (1870-1900), Eastlake (1870-1890), and Queen Anne (1870-1910). 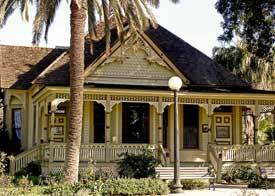 The early architectural styles of the Victorian era are not present in Fullerton because the city did not exist during that time. While early land owners in the area had constructed grove houses next to their fruit and nut orchards, George and Edward Amerige did not lay out the Fullerton townsite until 1887. The arrival of the Santa Fe Railroad shortly afterwards ushered later Victorian architectural styles- Eastlake and Queen Anne - into Fullerton.\Rather than an architectural style, Eastlake was a decorative style of ornament found on Victorian era houses, primarily Queen Anne and Stick styles. It is named after Charles Locke Eastlake (1833-1906), an English architect who wrote Hints on Household Taste in Furniture, Upholstery, and Others Details(1868), an instant best-seller in America. American manufacturers picked up Eastlake 's illustrations and began producing his intricate geometric shapes and complex patterns taken primarily from the Gothic Revival period, and builders began decorating Victorian homes with these pieces. The Queen Anne style was invented in England about 1860, where it was popularized by a number of architects, particularly Richard Norman Shaw. (The style had nothing do with the formal architecture produced during the reign of Queen Anne.) Spurred on by Shaw's architectural books, American architects immediately copied the style, at first in bricks, then in wood. While early Victorian buildings were simple in style, Queen Anne homes at their peak were fanciful and flamboyant, incorporating eclectic motifs drawn from many historical sources. Buildings are ornamented with bright colors, spindles, towers, turrets, wrap around porches, and other fanciful details. 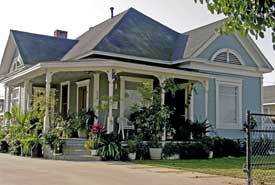 Wooden "gingerbread" trim in scrolled and rounded "fish-scale" patterns often grace gables and porches. The style was made popular by the machine age. Railroads shipped factory-made, precut architectural parts across the country where builders would use them to create picturesque, elaborate, and sometimes excessive homes. 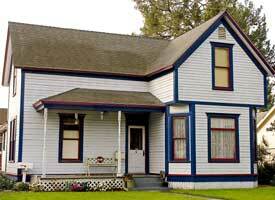 The Queen Anne style captured the imaginations of Americans and the style was used for homes throughout the country. The style worked well both in the country and in the city on narrow lots. Many of the Victorian buildings constructed during the town's early development have been destroyed or demolished, but a few do remain. 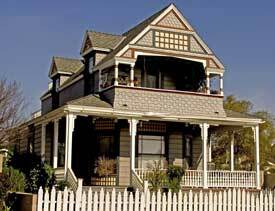 Examples of the Queen Anne style in Fullerton are the Cusick House (1895) at 315 East Amerige Avenue, the Espinoza Residence (1895), now at 324 W. Truslow Avenue (moved from 101 S. Pomona Avenue); the Dauser House (1902), a Queen Anne cottage at 720 Barris Drive (moved from 117 S. Pomona Avenue); and the Ruddock House (1905) at 520 West Amerige Avenue. 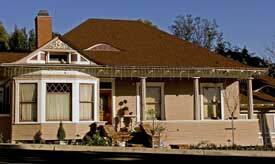 An example of the Eastlake style is the Dr. George Clark House (1894), listed on the National Register of Historic Places, and now located on the CSU Fullerton campus (moved from 114 N. Lemon Street ). From 1895 to 1915, Americans gradually turned away from the Victorian styles toward more simple, open, flexible floor plans. By the late 1800s, the Arts and Crafts movement had emerged; designers of this movement rejected Victorian architecture and instead promoted traditional building crafts and the use of local building materials. Baer, Morley. Painted Ladies: San Francisco 's Resplendent Victorians. New York: Dutton, 1978. Girouard, Mark. Sweetness and Light: The Queen Anne Movement, 1860-1900. Oxford: Clarendon Press, 1977. Guild, Robin. The Victorian House Book.New York: Rizzoli, 1989. Maass, John. The Gingerbread Age: A View of Victorian America. New York: Greenwich House, 1983. Maass, John. The Victorian Home in America. New York: Hawthorne Books, 1972. Massey, James C. and Shirley Maxwell. "Queen Anne and Why We Love Her So." Old House Journal April 2005: 90-97. Plante, Ellen M. The Victorian Home: The Grandeur and Comforts of the Victorian Era in Households Past and Present.Philadelphia: Running Press, 1995. Rusk, Katherine Knight. Renovating the Victorian House. San Francisco: 101 Productions, 1982. Sinclair, Peg G. Victorious Victorians: A Guide to Major Architectural Styles. New York: Holt, Rinehart, and Winston, 1985.